This is one of the very short Christmas stories for kids. Santa and his elves were up early. It was Christmas Eve, the happiest and busiest time of the year. “We’ll never get everything ready tonight!” said Felix. “Oh, don’t worry so much,” said Santa laughing. “We’ve never missed a Christmas yet!” Also, read Twas The Night Before Christmas Story. With the flick of the reins, Santa and his two helpers dashed off into the falling snow. There were presents for each of the young rabbits. And there was something special for the little fawn. “Some of my enchanted jingle bells!” Santa whispered to its mother. Santa even had something for Barney Bear though he’d been a bit mischievous this year. “Barney!” called Santa, “I’ve a present for you!” The sound of deep growly-bear snoring shook icicles from the roof of the cave opening. Quietly Santa tip-toed into the cave. Deep inside the cave, Barney was curled up fast asleep. Santa laid Barney’s present next to his nose so he’d see it as soon as he woke up. “Merry Christmas, Barney!” whispered Santa. Just then, Barney turned over and snored like thunder- so loudly it shook the walls. “Santa!” Gertie shouted into the cave, “Look out!” Gus and Gertie stared in horror as a mountain of snow crashed to the ground. It covered the entrance to the Barney’s cave. “Santa!” shouted Gus, “Are you alright?” “There’s no answer!” cried Gertie. “I’ll start digging,” Gus told Gertie. “You run for help and hurry!” Back at Santa’s workshop, the other elves were worried. “Santa should have been back by now,” said Felix. “It’s almost time to go!” You may also like to read, Story Of Santa Claus. Quickly, the elves piled into Santa’s toy-filled sleigh. With a shake of their jingle bells, the reindeer leaped into the air. Minutes later, the elves stood before a small ancient cottage. The door was squeaked open and out peered a tiny elf. His white beard reached down to his toes. “That’s Eli! How can he help?” cried Felix. “He’s as little as we are and he’s old and crooked to boot.” Eli listened carefully as Jared told him what had happened to Santa. The old elf smiled. Follow me! he said softly. Inside the dark cottage, Eli unlocked a wooden cabinet and took down a dusty pottery jar. Very carefully, Eli opened that jar. “It’s magic Sugar ‘n’ Spice Dust from Santa’s very first Christmas long, long ago. This is all that’s left in the world. I’ve been saving it all these years. But tonight we must use it to save Santa,” Eli chuckled. The elves rushed to Barney Bear’s cave. Gus was worn out from digging. “I haven’t heard a sound of Santa,” he moaned. Also, read The Littlest Elf. With a wink and nod, Eli mumbled some strange words. Then he flung his arm wide and sprinkle the sparkling magic dust over Santa’s sleigh full of toys. Santa’s elves had seen wondrous things in their work. But even they were astonished by what they saw. The toys in Santa’s sleigh sprang to life! Robots and teddy bears and dolls in pretty dresses began to dig with all their might. Steam shovels and dump trucks huffed and puffed as they scooped u snow A toy train hauled the snow as quickly as the busy workers could fill its cars. Shiny bicycles and toy race cars flooded the night with light. Shouting with joy, the elves too began to dig. 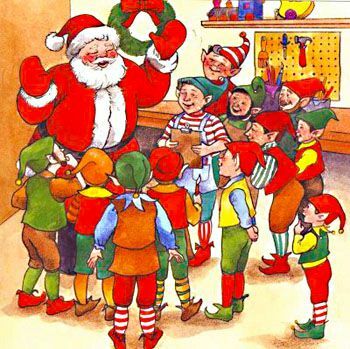 At last, near midnight, the miniature army of toys and elves rescued Santa. “Thank you all,” said Santa. “How lucky I’m to have such wonderful friends.” “Look,” cried Gertie, “Something’s happening to the toys!” The magic dust was wearing off. Slowly, as they were falling asleep, the toys wound down and then they were still. There were only toys, ordinary toys, once again. Santa and his elves loaded the toys into the sleigh. And with a merry “Ho, Ho, Ho!” they dashed into the starlit sky. Around the world, children slept, dreaming of Santa and the toys he would bring. Not one of them would ever know that this was the Christmas Santa almost missed! You may also like to read, Santa’s Christmas.